I have been ‘out-of-action’ sewing-wise recently (several cut out projects remain stitch-less so far), which explains my blog negelect but what really upsets me is all these amazing looking blog posts I haven’t read yet! I have a lot of sewing blogs to catch up on and I can’t wait for the inspiration hit. 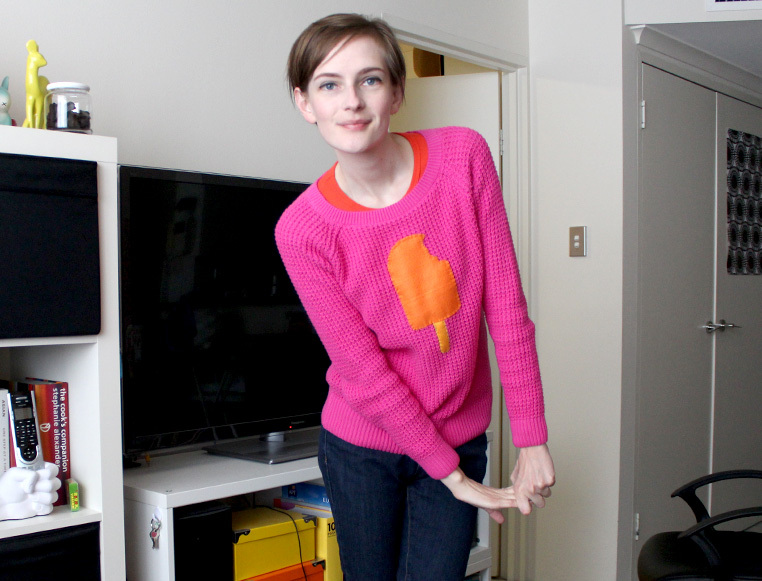 My plans for said felt was a jumper featuring one of my favorite things: A chilli! How fun would it be to have a jumper with one of my favorite foods?! 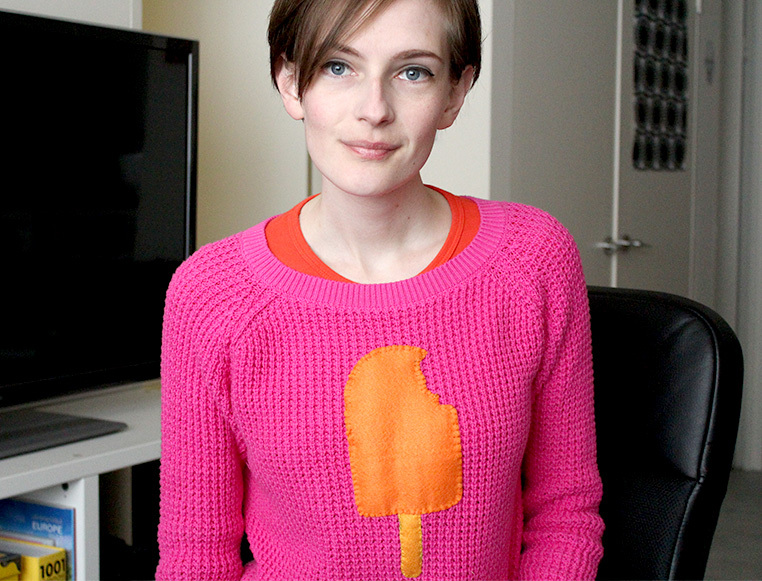 But before I attempted a more detailed design I wanted to test out how this felt would work/look sewn to a jumper, so this ice cream/Popsicle design was my test run. I’m wearing it right now! I love how bright and cheerful and non-winter it is! You can tell I prefer warm weather! Despite owning/sewing a lot of dresses one of my favorite things to wear are graphic printed tees but in the winter It’s too cold to wear/showcase a printed tee so this is a good alternative. I just love the dorky yet cute vibe of embellished sweaters (provided they aren’t too ’80s Kath day knight’ Yikes!! No sequins or shoulder pads for me thanks!) Anyway the stitching is pretty ‘blah’ but you know what? you get the idea/vibe I was going for so I still like it! Anyway here’s what I did…. Then I drew some rough shapes. I ended up ‘refining’ it a bit with the scissors (making the pole narrower etc). It was rather stupid to use a dark blue marker to make these shapes, because it does show through slightly on the other side. 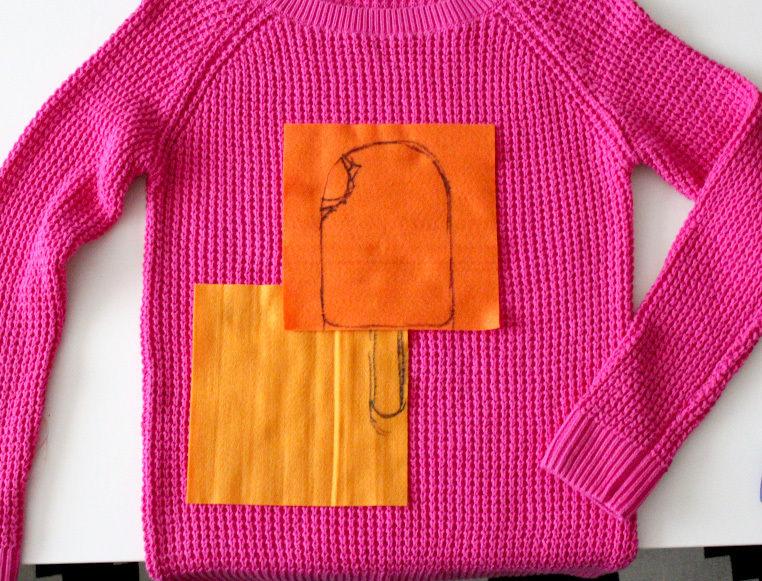 The felt kind of sticks to the jumper temporarily so you can play with the positioning and decide what looks best, while you are wearing it. 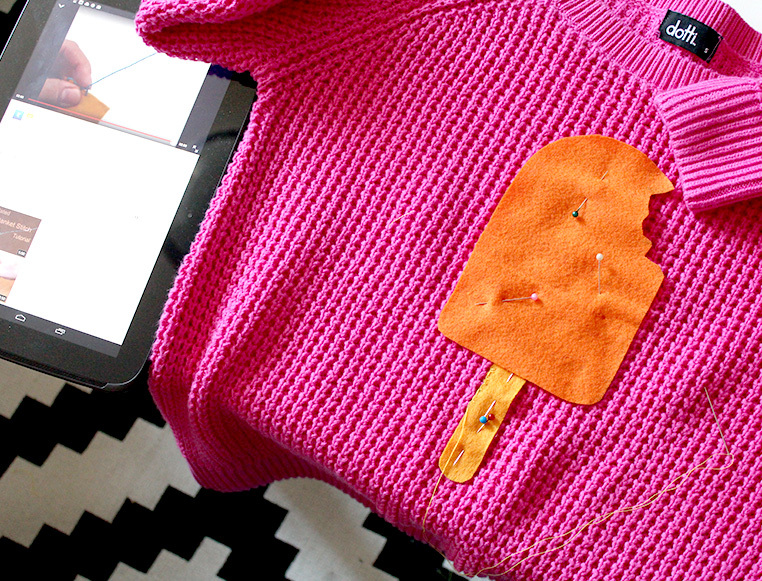 Next time I would have probably used an iron on adhesive called visoflex to adhere the felt to the jumper (before sewing around the design) but I did not want to make the trek to a fabric store just to get it so I just held it in place with pins while I sewed it. Then I googled “how to blanket stitch” and used polester sewing thread (doubled over) to stitch around the design. My hand sewing is terrible but ‘eh’ good enough…it’s just a bit of fun! No news yet on how well this felt design holds up in the wash. But when I find out I will update this blog post with my findings! Anyway…Yay! Summery fun in winter. Also speaking of icy poles or “pops” a lovely site called ‘Henry happened’ has some lovely looking DIY popsicle recipies. I guess for now I’ll stick to veggies and comfort food! I’ve got one word to say to you Kimmie – fabulous! I think this is brilliant! Also, yay for eating well and having good skin (both a work in progress for me)!! This looks so cute! I love your colour combination & it’s such a simple but effective design. You are so kind, lovely and thoughtful 🙂 Thank you! Icy cool design with lots of hot juicy colours – what an ace combination. The hand-stitching looks great and adds to the charm of the decoration. I am looking forward to your next applique adventure. I recently hand decorated a skirt using bondaweb (think its a UK version of visoflex) and a cobination of machine and hand-stitching which was lots of fun! So sweet! 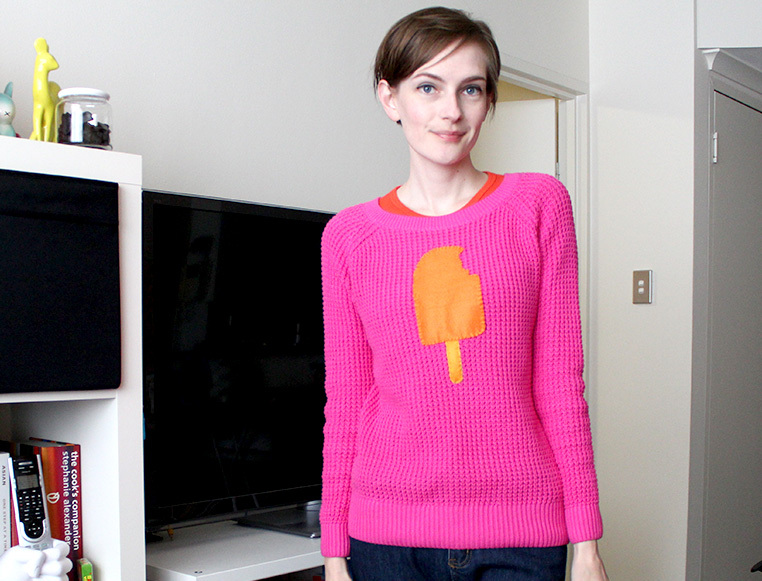 I have a Daiso weakness too, so I may have to copy you & add some cut-outs to my t-shirts! So adorable! 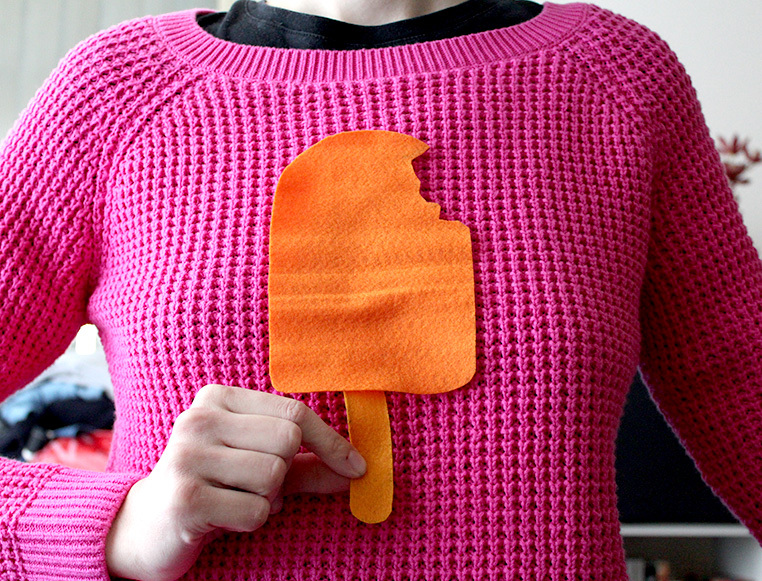 I love this idea of appliqué, and pink and orange are my favourite colour combo so you have won me! 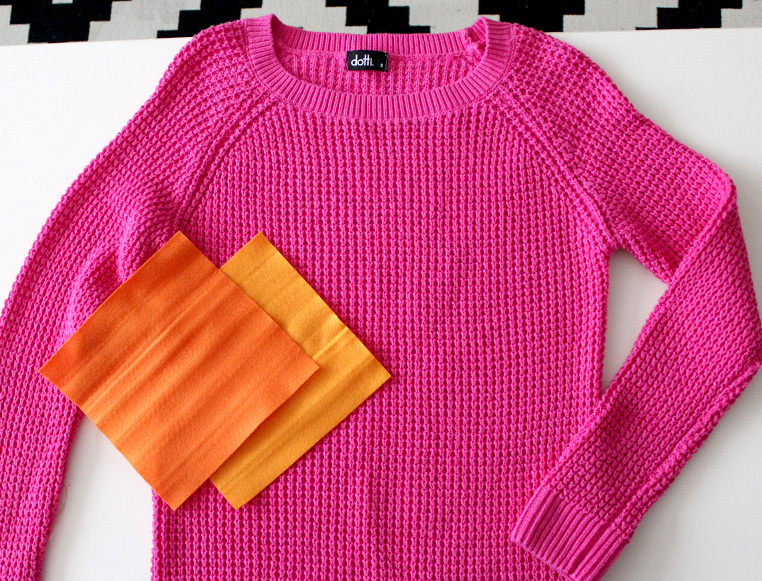 Yes orange and pink is one of my all time favorite combinations. I reckon! AMAZING for craft supplies! Lincrafts habby section is a nightmare overpriced and bad quality. Hope they get them back too!